Banff, Alberta, Canada. Have you ever thought of going to Banff? Wonder what Banff has to offer and what will you do once you get there? This is an amazing place. Hesitate no longer. It is a unique and majestic vacation destination in the protected wild-lands of Banff National Park in the Canadian Rockies. It’s great all year around. Ponder no longer, GO! I do not think anyone could be disappointed with what this town has to offer. It is one of my very favorite places I’ve ever been. It definitely has something for everyone: sports minded people, beauty and bird watchers, photographers, campers, families, hikers, adventure seekers, everyone. Like I already mentioned, Banff is one of my favorite places. I love to take pictures. So many that I took came out looking like paintings. The lakes are so blue and beautiful. The wildlife you can spot is over the top amazing. 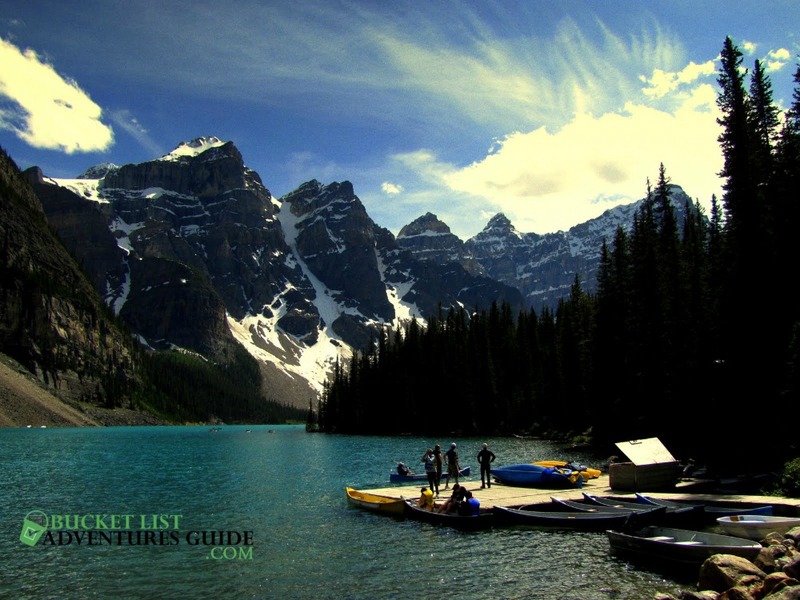 I will give you my take on 10 really great fun Banff things and sights to do while visiting this amazing destination. Lake Louise is probably one of the first spots you will want to visit, once you arrive to Banff. It is gorgeous, well known and an iconic Alberta treasure. Lake Louise offers many accommodations. It is a wonderful resort with a beautiful lake with several walking trails. It is a very popular place to visit in Banff. 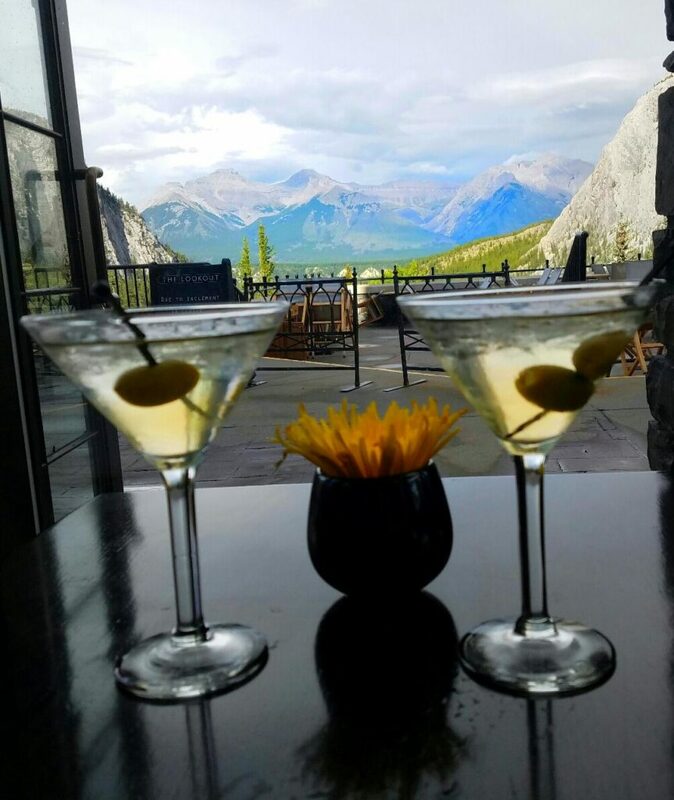 Relaxation Tip – Great place to enjoy a cocktail and take in the beautiful sights of the lake, the flowers and the panoramic views. Lake Moraine is another gorgeous lake. When I think of these two lakes, Lake Louise and Lake Moraine, what quickly comes to mind: Lake Louise is beautiful and fancy. Lake Moraine is fun and laid back. More of a rugged space. More solitude. It feels like you are one with nature at Lake Moraine. More restful and relaxing. Lake Moraine, is by far my favorite lake in the Banff area. One not to miss. If I only had time to see one, Lake Moraine would be it. Lake Louise is more widely known and can be crazy busy. Lake Moraine is much more serene and quiet. Lodging Tip – Rooms are quite expensive, nice for a special treat. Restaurant, AMAZING. Need reservations nightly, guest of lodge or not. Searching for wildlife is a fun thing to do. All you have to do is drive around and keep your eyes open or when you see a bunch of cars stopped, you know there is something cool to see. Last time I was there my favorite was a mother moose and her calf and another day I saw a mother brown bear and her two cubs. Make sure you bring a camera. I was surprised how close she came to all of us. It was a cool sight. 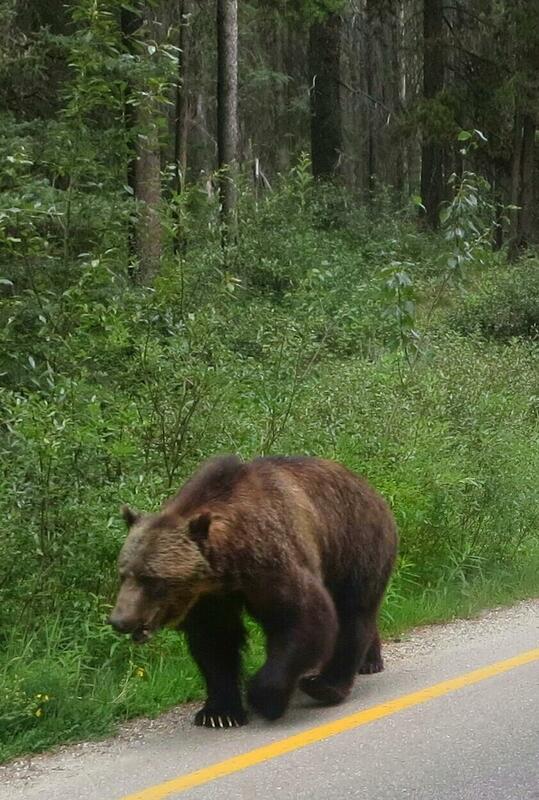 On my most recent trip to Banff, we were on a small road and a grizzly bear was frighteningly close. We were on our motorcycles and couldn’t go anywhere. I got a picture quickly and didn’t look him in the eyes. I think he had other things on his mind, I think he was searching for buffalo berries. Luckily, he was more interested in finding more berries and not interested in me. Wildlife Tip – Wildlife is fun to watch. 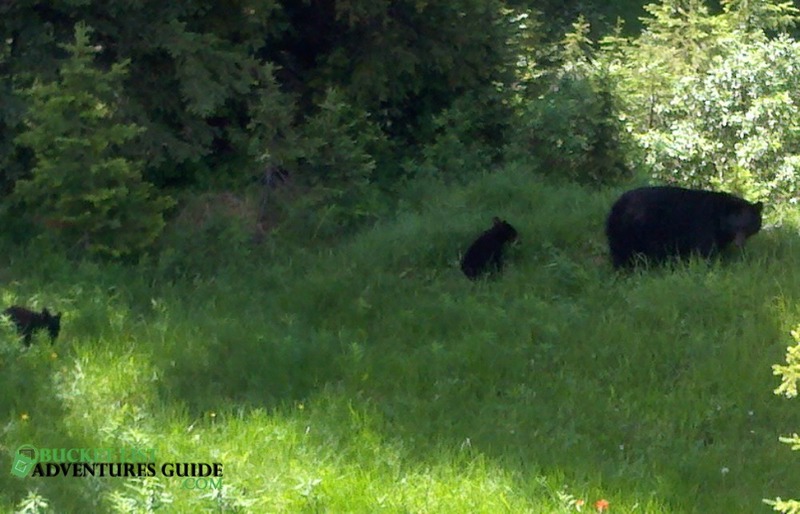 But, keep your distance, especially if see cubs and calves alone, know Momma is near. Grizzly Bear, a little too close for my comfort. 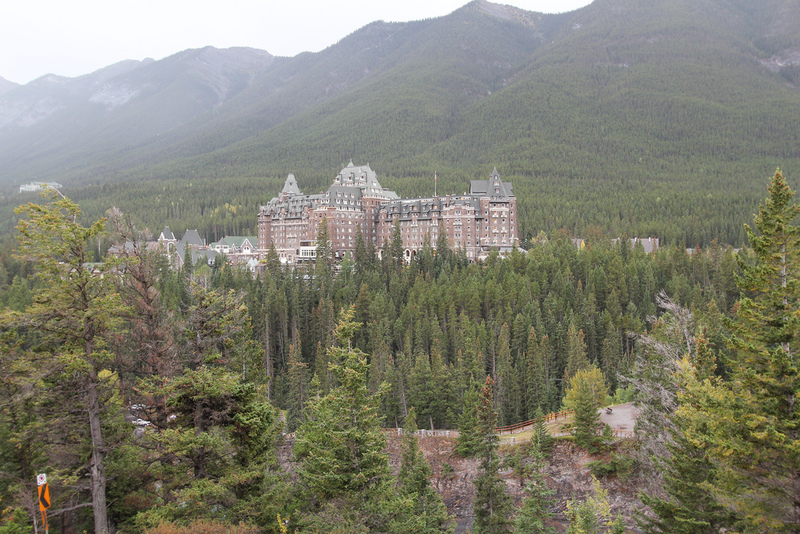 Banff Springs Hotel is called the “Castle in the Rockies”. Located in the heart of Banff National Park, the world famous Fairmont Banff Springs hotel stands as a landmark in the picturesque alpine town of Banff. It has been operating for more than 125 years. Hotel Tip – Everyone is welcome to visit this hotel, even if you are not a guest. Come for afternoon tea, a cocktail, or just to look around. Having a cocktail at the Banff Springs Hotel. Look at that amazing view. Cheers! Banff Avenue Shopping is a major attraction. Downtown Banff provides fantastic shopping that can be found along Banff Ave., Bear St. and all of the side streets and malls in between. Souvenir hunters have a wide selection of gift shops to choose from, and fashionistas will be impressed by the range of clothing stores. There are also a good variety of jewelers, outdoor stores, ski shops, ice cream parlors and much more. Banff Avenue Tip – There are a lot of restaurants to try in this area. Make sure you try the Poutine, which is a popular favorite: french fries, cheese curds and gravy. Banff Gondola is a touristy thing to do, but way cool. 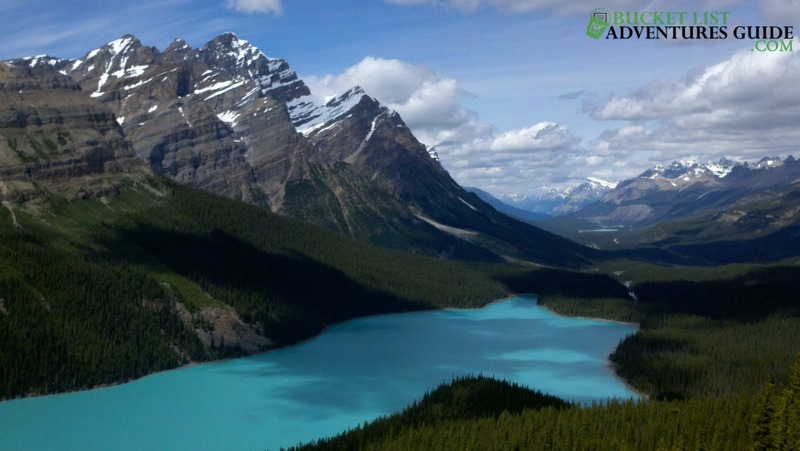 It is located 5 minutes from Banff on Sulphur Mountain, in the heart of the Canadian Rockies. Sit back and marvel at the gorgeous views of Banff, Bow Valley and a 360 degree view of 6 mountain ranges in a glass enclosed gondola. You will feel like you are on top of the world when standing on their observation deck. Construction Tip – Most of the facilities are open, but they are remodeling some areas of this attraction. So do a little research before you go. Peyto Lake is amazing. Remember when I said my pictures were like paintings? This is just one of my favorites. It is about 25 miles north of Lake Louise. Its milky blue color is unique and will change with the seasons and time of day. It is an easy drive. Once you get there, it is a 10-15 hike to the Peyto Lake lookout. Doesn’t this picture look like a painting or a poster of a painting? Sorry, I gush about this, but that is how I feel about this area, so breathtakingly beautiful at every turn. Parking Tip – You will want to park on the lower level parking lot, upper is for motor coaches. It is also a little trek to see the lake, so take a walking stick if you need and a bottle of water. If you have someone that can’t make the climb you can park in the upper lot, it is for motor coaches and handicapped parking for an easier access to the lookout. Cascade Gardens is a relaxing, beautiful place to visit. The garden literally cascades down the hill and the variety of colors are breathtaking. It is easily accessed while on a walking tour of the town of Banff. We spent about an hour walking through the extremely well tended gardens. Flowers were still in full bloom. There were so many great photo opportunities. Take some time to relax and enjoy this quiet and serene attraction. Garden Tip – The flowers are in full bloom in late spring and summer, but still pretty to walk through in the fall. Helen Lake Trail is one of the finest hikes you’ll find in Banff National Park. The trail slowly climbs in a straight direction for approximately a mile then works it’s way up a few short switch backs before arriving at the meadows. This meadow is over a mile long and one of the nicest you’ll see in the Canadian Rockies. As you trek on, the views continue to amaze. Helen Creek glistens as it flows down the middle of the meadow towards the valley bottom. Keep hiking up through the meadows until you reach Helen Lake. This is an excellent spot to have a picnic before you turn back. Trail (Trip) Tip – Be aware that the first section of the trail is well worn with never ending tree roots to trip over. Continued foot traffic has eroded the earth around the roots exposing them. Walking sticks come in handy on this trek. 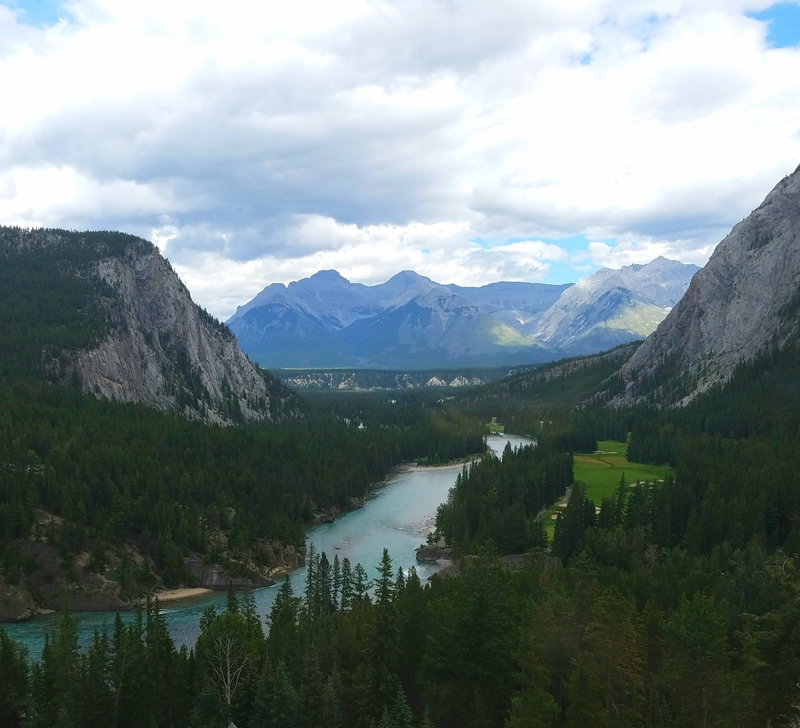 Riding Hwy 93 – Zero to Jasper was a highlight of our trip. The impressive stretch of road between Lake Louise and Jasper was incredible. Some say it is some of the most rewarding travel experiences in the Canadian Rockies, & in the world. Touring the Icefields Parkway in both directions, north and south, offers the best experiences with different views and increased opportunities for wildlife viewing. We saw many black bears along the way. This is a route not to be missed. Travel Tip – Head out early to avoid some of the traffic and increase your chances to see wildlife. As you can see, there is a lot to do and see in Banff. I’ve just listed 10 great things. There is so much more: hiking everywhere, boating, skiing, tours on just about any topic you may be interested in and more. I hope you enjoyed reading this and even more so hope you enjoy your vacation to Banff. So do a little research before you go and figure out what you’d like to see and do. I hope you find it as beautiful and breathtaking as I do. Enjoy!